After returning from his disastrous mission to central Africa to rescue a German colonial governor, the explorer Henry Morton Stanley was eager to distract from accusations of brutality with his ‘discovery’ of African pygmies. Brian Murray explores how after Stanley’s trip the African pygmy, in the form of stereotype and allegory, made its way into late Victorian society. 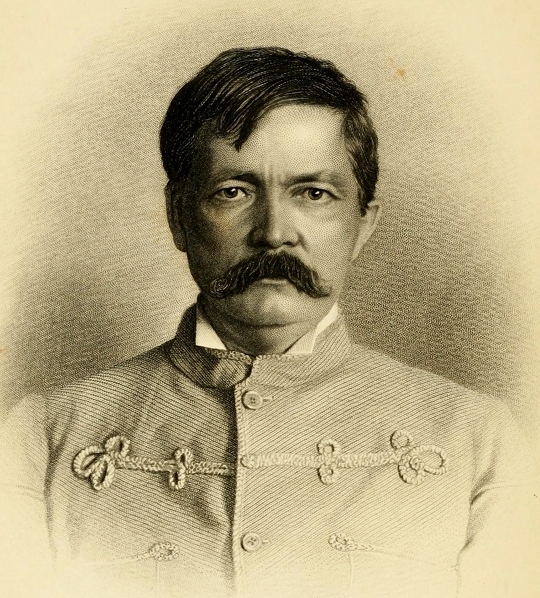 On 28 October 1888 the Welsh-American explorer Henry Morton Stanley was entrenched deep in the unexplored Ituri rainforest of the Congo. He had been hacking his way back and forth through the jungle for months in his attempt to relieve the colonial governor Emin Pasha, whose province in the southern Sudan was under siege by a coalition of Sudanese and Arab insurgents under the command of the messianic cleric Muhammad Ahmad. Famished and exhausted, Stanley sent his East-African porters out to pillage what they could from native farms. On this occasion they brought back an unusual prize: a “couple of pygmies”. These “pygmies” were most likely one of several diminutive ethnic groups (including the Aka, Twa, Mbuti and Efé) that still inhabit the forests in the upper Congo Basin. But for Stanley these Africans did not merely represent intriguing ethnographic specimens; they were also tokens of a rich historical and mythological heritage, a literary tradition stretching back to Homer and the Old Testament. Not one London editor could guess the feelings with which I regarded this manikin from the solitudes of the vast central African forest . . . That little body of his represented the oldest types of primeval man, descended from the outcasts of the earliest ages, the Ishmaels of the primitive race . . . Even as long ago as forty centuries ago they were known as pigmies, and the famous battle between them and the storks was rendered into song . . . they reigned over Darkest Africa undisputed lords; they are there yet, while countless dynasties of Egypt and Assyria, Persia, Greece and Rome, have flourished for comparatively brief periods, and expired. Even though Stanley’s soliloquy is couched in racist European assumptions about the “primitive” nature of Africa and Africans, he nonetheless credits these “manikins” of the forest with an auspicious imperial history of their own. (His reference to the “Father of Poets” alludes to a mythical battle between pygmies and storks mentioned in Homer’s Iliad.) Stanley’s pygmies are venerable ancients who predate and have outlasted all the great empires of antiquity. Stanley’s own melodramatic account of the Emin Pasha Relief Expedition, In Darkest Africa, sold 150,000 copies in 1890 alone and was translated into ten European languages. There were numerous spin-offs and pirate editions in circulation on both sides of the Atlantic before Stanley had even completed the manuscript. The expedition itself, a quasi-military enterprise co-funded by the Egyptian Government and several wealthy individuals, was initially pitched as a sequel to Stanley’s famous mission to find the Scottish missionary David Livingstone in 1870. However, the “search and rescue” narrative did not go to plan on this occasion. 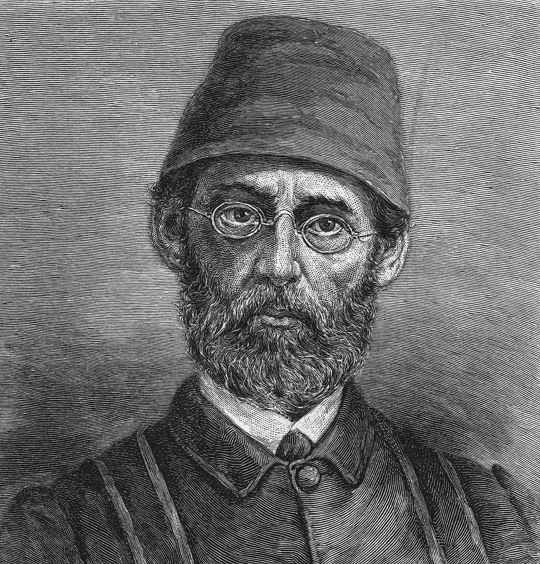 Emin Pasha was the adopted name of Eduard Schnitzer, a German-Jewish doctor born in Silesia who had entered Ottoman service in 1865 and subsequently converted to Islam. Neither Stanley nor Emin were particularly fond of each other and the “rescue” ultimately descended into farce when Emin fell over a balcony and fractured his skull at a celebratory dinner in Zanzibar in December 1889 and Stanley was forced to return to Britain without his prize. Much to Stanley’s dismay, on his recovery Emin took up a post with the German colonial service and soon after the “rescued” governor was making his way back to his province with the intention of annexing it for Germany. Accusations that Stanley and his officers had resorted to brutality, violence and plunder were widespread in the British and American press. By Stanley’s own admission the expedition was directly and indirectly responsible for the deaths of approximately one thousand individuals, mostly African soldiers, porters and sundry “belligerent natives”. Many also questioned Stanley’s wisdom in leaving the ill-tempered and mentally unstable Edward Barttelot in command of a “rear column” at Yambuya on the Aruwimi river. Stanley had commanded Major Barttelot to await the arrival of supplies and men from the Arab merchant and slave-trader Tippu-Tip (Hamid bin Muhammad el Murjebi) while his own advance column powered on to Emin’s camp on Lake Albert. However, when Stanley finally returned to Yambuya, he found that the strength of the rear column had dwindled from 271 to 132 individuals through death and desertion. The dead included two officers, Barttelot and James Sligo Jameson. Barttelot had been shot by one of his own subordinates after badly beating the African soldier’s wife in one of his frequent fits of violent rage. Jameson, an heir to the Anglo-Irish Jameson Whiskey fortune, who had paid £1000 for the privilege of joining the expedition, died of an uncontroversial fever. 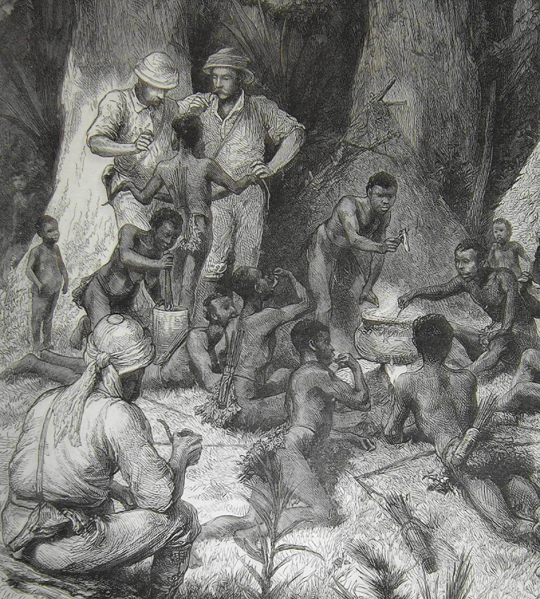 However, other members of the expedition suggested that the young officer had developed an unhealthy obsession with cannibalism; this pathological curiosity led him to purchase a ten-year slave girl whom he reportedly handed over to a group of local cannibals to be stabbed, dismembered, and eaten. A budding ethnographer, Jameson was said to have recorded the grizzly proceedings in a series of calmly-executed watercolours. The controversy reached its peak in December 1890 when a group of London philanthropists and humanitarians – the Aborigines Protection Society – voted to condemn the atrocities perpetrated by Stanley’s “filibustering and quixotic” expedition. The shambolic and shameful history of the Emin Pasha Relief Expedition did much to discredit the notion that European explorers were engaged in a noble quest to shed the light of Christianity and civilisation upon the benighted ‘Dark Continent’. 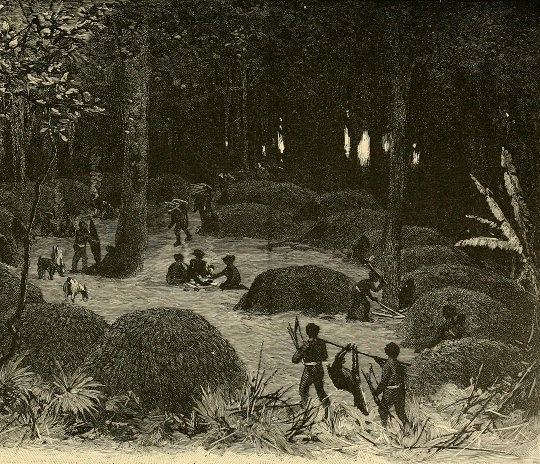 A sketch by Jameson as featured in his The Story of the Rear Column of the Emin Pasha Relief Expedition (1891). The handwritten caption to the picture refers to a “Major B. seated on the drum”, presumably referring to Major Barttelot with whom Jameson led the ill-fated rear column. Yet during the summer of 1890 Stanley himself still received largely positive coverage in popular newspapers and magazines. His image also featured in advertisements for tents, tea, Congo Brand soap and Bovril. George Bernard Shaw would later complain that the nation had succumbed to “Stanley worship”. The explorer was even given the royal stamp of approval at the Stanley and African Exhibition – patronized by Queen Victoria and King Leopold II of Belgium – which opened on Regent’s Street in March 1890 in advance of Stanley’s return in Britain. In May, Stanley’s scheduled debriefing to the Royal Geographical Society was moved to the Royal Albert Hall to accommodate an audience of 8,000 spectators. When compared with Stanley’s previous journeys, the expedition had contributed little in the way of new geographical data. Yet mindful of controversy, Stanley was now eager to emphasise the passage through the previously unexplored Ituri rainforest and his encounter with the pygmies as the expedition’s primary contribution to geographical and ethnographic knowledge. In his book, Stanley identifies two distinct “racial types” of pygmy in the Ituri: the first is pretty, proportioned and intelligent, while the second is “fitly characteristic of the link long sought between the average modern humanity and its Darwinian progenitors, and certainly deserving of being classed as an extremely low, degraded, almost a bestial type of a human being”. In this period many races were classed as “missing links” and human sub-species by European scientists and anthropologists, and such classifications often anticipated the inevitable extinction (or extermination) of these races. Thus for Stanley and his contemporaries, colonial expansion and imperial aggression were to some extent justified and naturalised through the rhetoric of this pseudo-Darwinian racism. “Forest Dwarfs eating Snakes’, The Graphic, 30 April 1890. But although the pygmies had, for Europeans, just recently emerged from the realm of fable, in the midst of Stanley-mania they were soon re-mythologised and repackaged in all manner of ways. There were pygmy-related music hall and variety shows such as “Stanley and His African Dwarfs: A New and Unique Entertainment” in which Stanley was portrayed as side show exhibitor, leading his troop of blackface dwarf minstrels through a routine of comic sketches and musical numbers. In 1904 the traveller and big-game hunter James Harrison brought a group of six Mbuti pygmies to Britain, exhibiting these “volunteers” nightly on an eighteen-month tour of British music halls. The African pygmy also entered popular culture in a figurative guise. One radical pamphlet of 1890 alleged that the ruling Tory party were “like the black dwarfs Stanley found in the great forest of Central Africa”. All the people around them are tall and robust, but they have been made what they are by unfavourable conditions . 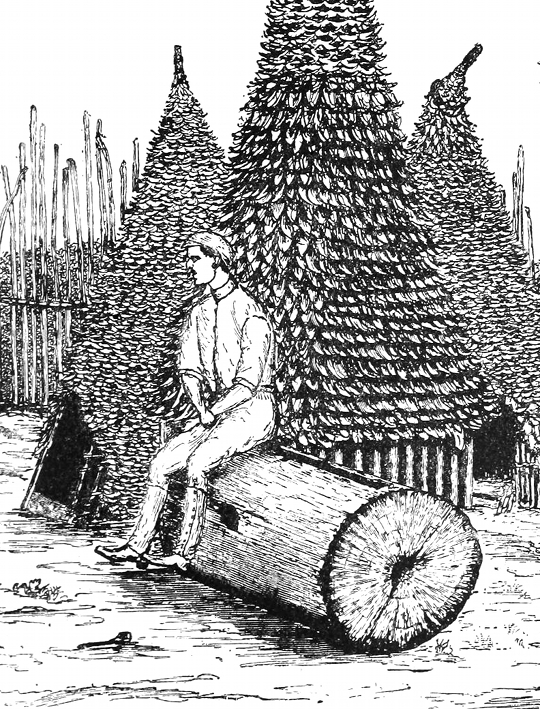 . . Cut down the forest, let in the light, cultivate the soil, and a better race of men will take their place . . . In this opportune illustration read the history, and the end of Toryism. The pygmies proved a convenient political allegory and their anticipated extinction via natural selection became a favourite metaphor for all manner of commentators. The most famous allegorical appropriation of Stanley’s “dwarfs” appeared in the reformist manifesto In Darkest England and the Way Out (1890), written by the Salvation Army-founder William Booth and the sensational journalist W.T. Stead. Booth takes Stanley’s two races of pygmy – which he labels the “human baboon” and the “handsome dwarf” – as an allegory for two distinct types of urban poor: “the vicious, lazy lout, and the toiling slave”. Booth reads the degradations of darkest England, where the honest and desperate poor were being exploited and enslaved by the “barbarians” of industrial capitalism, as equivalent to the horrors “which Stanley had found existing in the great Equatorial forest”. If there is a darkest Africa, asks the reformer, “is there not also a darkest England? Civilisation . . . can breed its own barbarians, does it not also breed its own pygmies?” Indeed, Stanley too saw the Darwinian “struggle for existence” replicated in the heart of the imperial metropolis, where “pale, overworked, dwarfed, stoop-shouldered” individuals struggled amidst “the human tide flowing into the city over London Bridge”. In an atmosphere of such anxiety it took no great leap for H. G. Wells to imagine a future society in which humanity had evolved into two distinct species. In The Time Machine (1895) the Time Traveller explores a forest world inhabited by two dwarfish races (the effete Eloi and the bestial Morlocks), perhaps an echo of Stanley and Booth’s distinction between the “handsome dwarf” and the “human baboon”. However, these pygmies are not the degenerate progeny of some obscure African race; they are the direct descendants of nineteenth-century Londoners, and the cause of their degeneration is the modern industrial civilisation which was meant to ensure British imperial dominance. Stanley’s story of the decline and fall of the once “undisputed lords” of Africa would have set alarm bells ringing in the imperial metropolis and raised the prospect that the British empire might join “Egypt and Assyria, Persia, Greece and Rome” in the litany of dynasties which “have flourished for comparatively brief periods, and expired”. editing a new edition of H.M. Stanley’s In Darkest Africa. 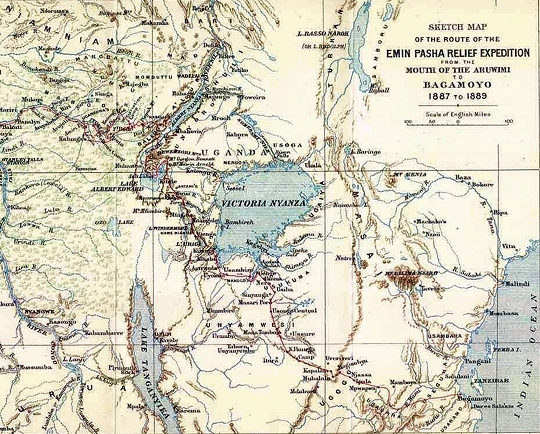 The Heart of Africa: Three Years’ Travels and Adventures in the Unexplored Regions of Central Africa from 1868 to 1871 (1874), by Georg Schweinfurth. The Story of the Rear Column of the Emin Pasha Relief Expedition (1891), by James S. Jameson.